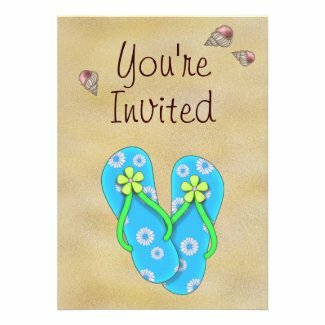 Take a look at this fun collection of Flip Flop Custom Birthday Party Invitations. They are great for any summer birthday and perfect for birthday parties at the beach. Select any invitation to view additional details and personalize. The following sites have a great selection of Flip Flop themed party supplies. You will find cake and cupcake supplies, decorations, favors and more.